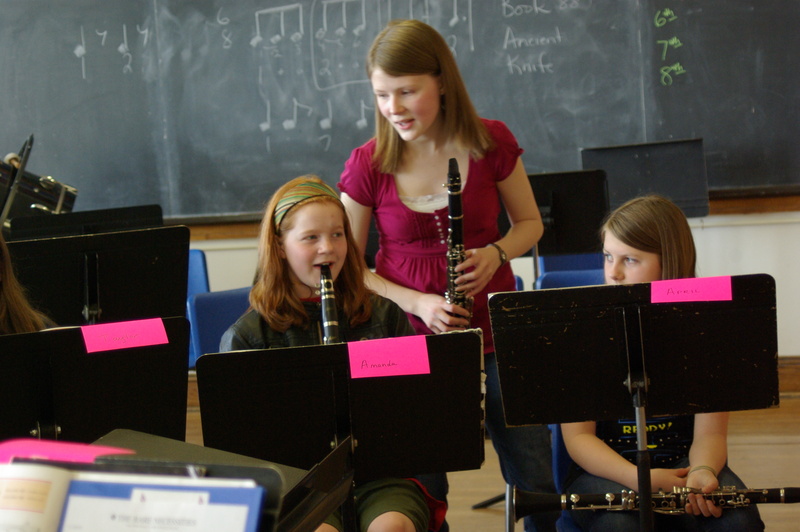 This shows the clarinetist at their fourth lesson. They have really grown in their playing abilities, and the confidence they have in themselves and their music. Playing trios and duets, as they are here, has also been really helpful for this as they have had to think independently about what they were playing as opposed to listening to the people around them. 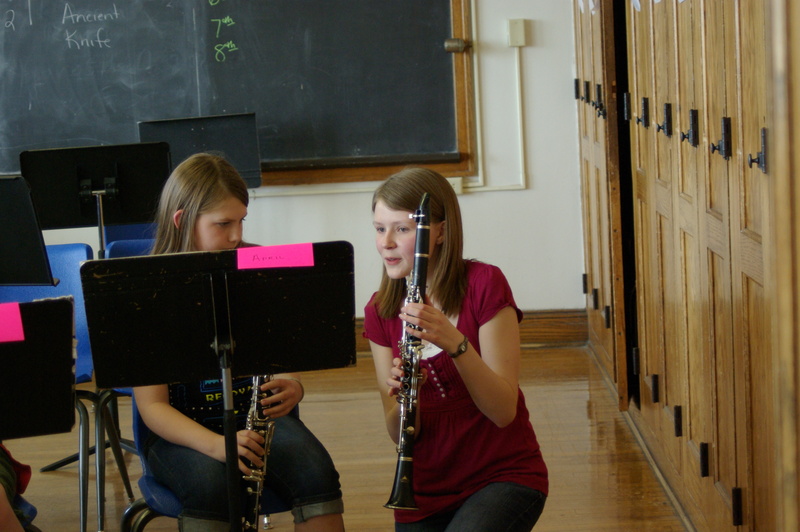 I had my first lesson with seven sixth grade clarinetists on March 31. I apologize that I am just now blogging about it nearly a month later, but sometimes life gets crazy busy. I will try to catch up on posts and get back on track, as I have now completed four awesome lessons. The idea of having all seven girls at one time for a group lesson was not exactly what I had originally planned for, but it is going well. They are all at somewhat different levels, in terms of their ability. However, all of them are interested in learning and being open to suggestions, which makes this fun. The first lesson was kind of trial and error, as I did not know where they were at, so had them play a variety of music in order to figure out what we should work on in the future. “Bear Necessities” was a challenge, but something they wanted to play, so we are working on this a bit at every lesson, and I’m encouraging them to practice it at home. Hopefully it will come together by the end of our short six weeks’ time. I have 45 minutes with them each week, which is quite a while for 12-year-olds to stay focused. So, I decided to play a musical game each week during the last 15 minutes, which the girls have really enjoyed. This first week, it was music symbol pictionary. They definitely liked getting the opportunity to draw on the chalk board! Here are some pictures of my visit to the middle school on March 4. 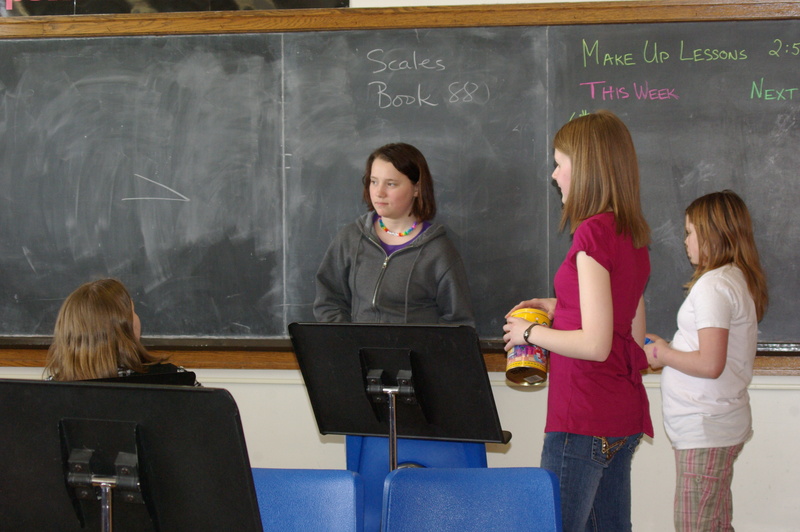 While there, I gave the sixth grade band an introduction to my project and what I was going to be doing. I also played a bit and told them about the clarinet. It was great to see how interested many of them were! 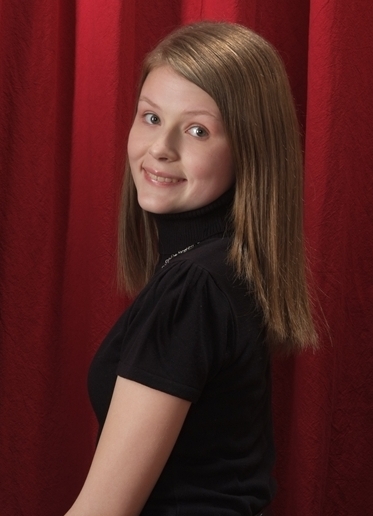 My name is Hayley and I am a clarinetist from Cedar Rapids, Iowa. I am so excited to be a part of the Iowa Makes Music Arts leadership project! 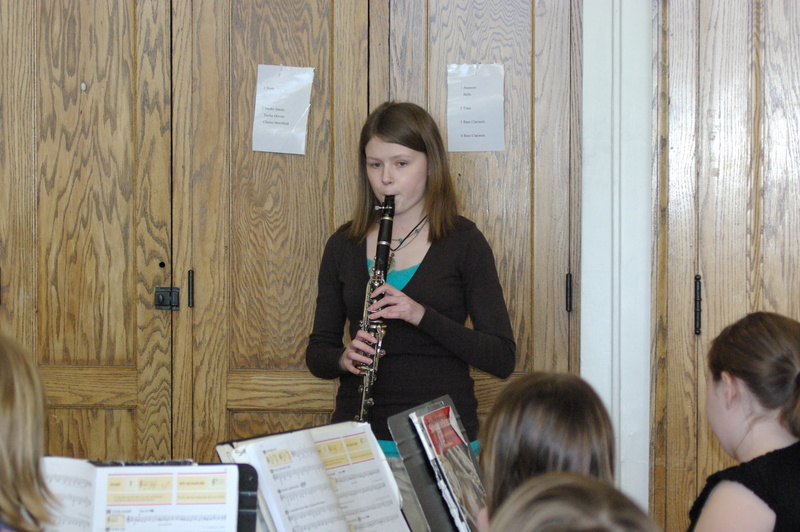 For my project, I am going to teach lessons to beginning clarinetists at the middle school I attended. I plan to start next week with about four sixth grade students. 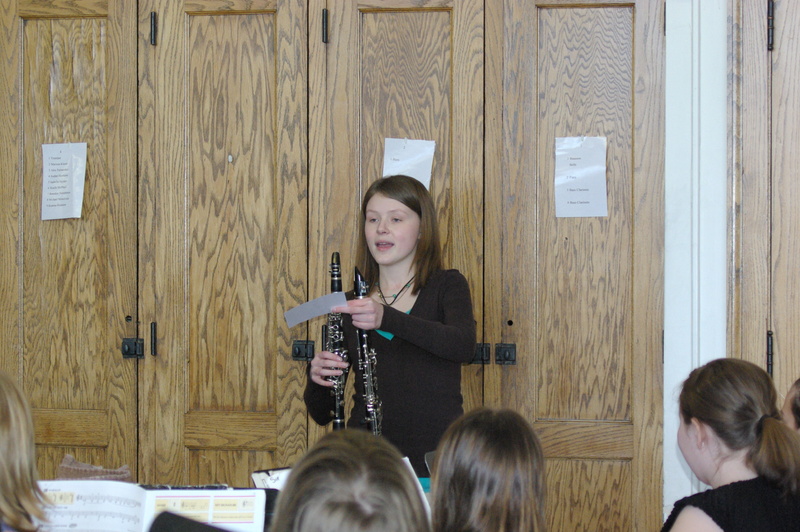 Previously, I made a presentation to their band about the clarinet, what I have had the opportunity to do with it, and what I was going to be doing for students at the middle school. I am currently planning what to do with the students in lessons, and figuring out what the most important concepts to teach them are. I wanted to do this project because it seems that middle school is a difficult time for many students to get excited about music. There are not as many opportunities at this level, and I feel that it is extremely important that young musicians learn a lot about how to play their instrument correctly at an early age. 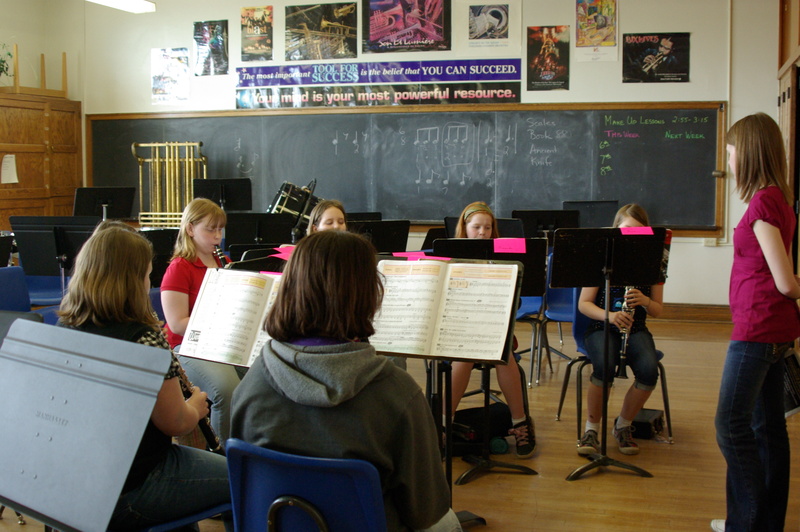 This can be a challenge for band directors, as they are not necessarily experts on all of the instruments that they are teaching, and they are often overwhelmed by large numbers of students. I know this is particularly a problem at the middle school where I am working, as the sixth grade band is much larger than it has been in previous years. I hope to re-enforce the foundations that these students are learning, and give them individual attention in hopes of noticing every detail of their playing. I also want to teach them different fun things to do with music. My hope is that these things will allow them to be more excited about music.